With its distinctive exterior design, powerful 4-cylinder engine, sport-oriented suspension and spacious interior, Altima would seem to have it all. Now, Nissan has found one more attribute that completes the Altima's line-up – superb fuel economy from a state-of-the-art hybrid gasoline-electric powertrain. The Altima Hybrid continues Nissan's best-selling car's performance tradition in a new variation – a hybrid powertrain mates the 2.5-liter 4-cylinder engine and Xtronic™ CVT (Continuously Variable Transmission) with an electric motor and generator that increases fuel economy while maintaining low tailpipe emissions. The Altima Hybrid will be available in eight states. The vehicle has been certified to meet California emissions requirements and will be sold beginning in early 2007 in those states that have adopted California emissions regulations: California, New York, Massachusetts, Connecticut, Vermont, Rhode Island, Maine and New Jersey. These states are among the strongest markets for hybrid vehicles. Nissan's commitment to the environment takes a different form than might be found at other automakers. While Nissan strives to offer the most advanced fuel-saving technology available, the company also believes that drivers should not have to sacrifice any of the style or performance attributes that remain at the top of the reasons for buying a new Nissan. For that reason, the Altima Hybrid is marked with the same expressive styling as its non-hybrid brethren – inside and out. The engine and suspension in the Altima Hybrid deliver the same spirited performance as its more conventional siblings. The combination of passionate driving and passion for the environment is what makes the Altima Hybrid the standout in its segment. The Altima Hybrid is the latest in a long line of Nissan environmental automotive initiatives. tailpipe is cleaner than the air going into the engine. · Nissan expanded its PZEV offerings to include Altima's 2.5-liter engine in 2005.
the end of fiscal year 2007. · Nissan introduced the Tino hybrid in Japan in 2000.
recently introducing an X-TRAIL model with a Nissan-designed fuel cell stack. The new Altima HEV will be assembled at the Nissan North America Manufacturing Smyrna, Tennessee plant. 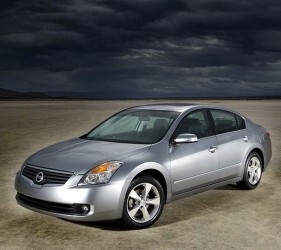 For more information on the Nissan Altima and other Nissan products, please visit www.nissannews.com.